I've never watched the Transformers movies, but if my understanding is correct, those flicks were about 1974 AMC Gremlins morphing into deep fried banana splits, thereby earning free admission to the Texas State Fair. Or something along those lines. Even if I'm a bit off in my understanding of the Transformers plot, you have to admit the idea of effortless transformation on demand is a pretty cool thing. Politicians do it all the time based on poll numbers and density of cameras within 25 yards, so why shouldn’t rifles be able to perform the same feat? Getting back to the point, since this is the Beretta Blog, let’s talk about transformation with respect to the new Beretta ARX100 rifle. Its family heritage is the ARX160 - a 21st century rifle designed for the Italian (and other) militaries and law enforcement organizations. As a result, some mondo engineering has been applied to make this rifle fit not only a wide variety of potential shooters, but also easily adapt to a broad range of requirements. If you haven’t noticed, people come in all shapes and size. Some do most things, including shooting, with the right hands, while others buck the trend and use the left side. Folks are also tall, short and everywhere in between. Don’t even get me started on accessories preferences as it seems no two people on the North American continent can agree on exactly how a rifle should be equipped with optional gear. Apparently the main design goal of the Beretta ARX100 is to not only accept all these physical and opinion differences, but embrace them. The rifle has been designed to be instantly customizable in many, many ways. Most importantly, all this customization can be done without tools - that’s where the engineering magic comes in. The stock makes judicious use of polymer for ergonomic purposes and to keep the weight down. The ARX may not look light, but it weighs in at just 6.8 pounds unloaded. While the stock appears to be one piece, it easily separates into upper and lower receivers with no tools required. Just fold the stock into the pistol position, put the bolt in the maintenance position and rotate the lower receiver out while moving the safety lever past the “S” mark. 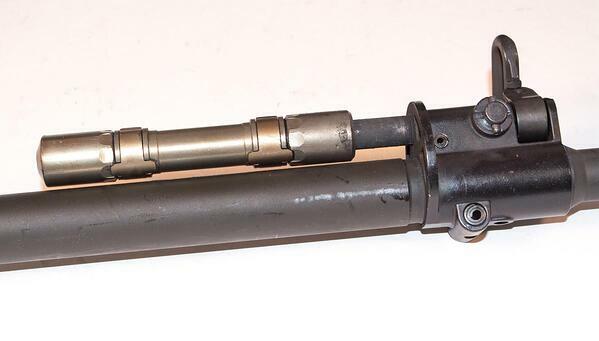 This maneuver frees the bolt carrier and bolt and allows access to the trigger area for cleaning. As might be expected, the stock is adjustable for length of pull, offering four different positions. Or, you if you want, you can shoot the ARX100 in a pistol configuration with the stock folded to the side. 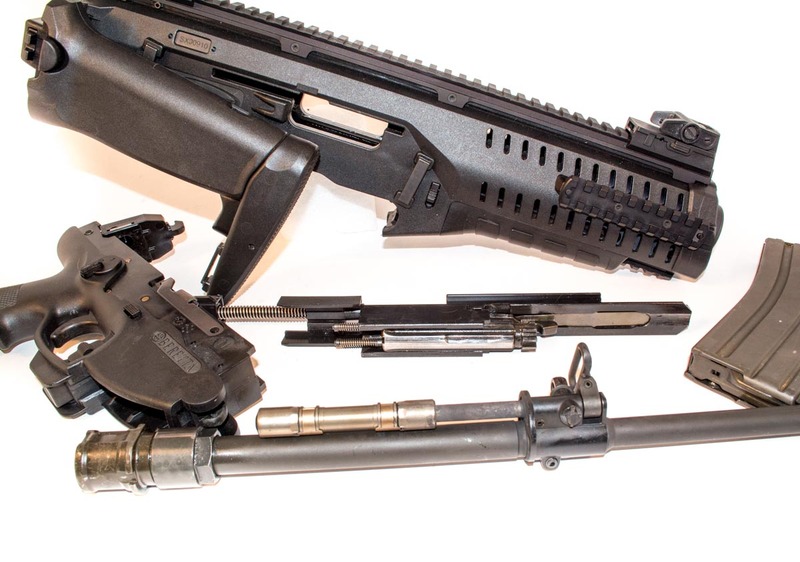 The entire top of the receiver is covered with a single rail, thereby eliminating the “mating” problem of separate receiver and fore end rails on AR-type rifles. Up front, there are four-inch rails at the three and nine o’clock positions and a 1 ½ inch rail at the six o’clock spot. On that monolithic rail, you’ll find two removable flip-up sights. They’re made of polymer and lock into place with a push button. The front sight has an adjustable post and the rear sight features and aperture wheel with range options 100 to 600 yard distances. The grip is molded into the stock and not removable, but it does offer a secret hiding spot for extra parts, batteries or an emergency ration of duck jerky. 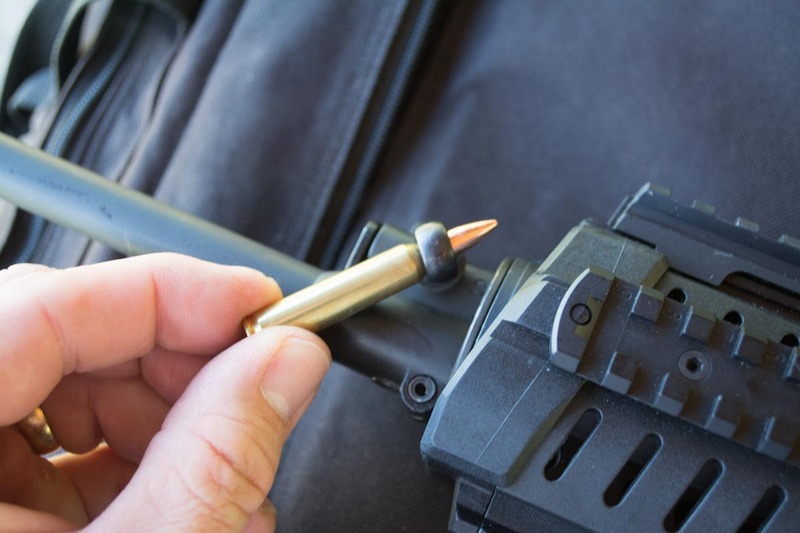 One of the neatest features of the ARX100 is the “switchable” ejection. Because the rifle is designed with two extractors in place, it’s already set up to throw spent brass casings right or left depending your preference. An open receiver on both sides, combined with a cross bolt switch that deactivates one extractor means you can literally change ejection mid-magazine simply by pressing the recessed cross bolt with a bullet tip. Much to the dismay of shooters on my left, I did this midway through a magazine dump - just because I could and I wanted to see how it worked. Cool. You might assume that since the ejection pattern is completely ambidextrous, other controls are too. And you’d be right. The big difference with the ARX100 is that it’s ambidextrous in a very pure way. Most rifles begrudgingly allow one to enable some left-handed shooter features by tweaking things, but the Beretta ARX100 has no such bias against right or left-handed shooters. Everything is already ready to go for both right and left-handed shooters and there is no “right-hand bias” present in the design. Safety controls are already on both sides of the receiver and are identical. Bolt catch and release levers are on both sides of the trigger guard and are also identical. There's an extra bolt catch button mounted dead center under the trigger guard, so it favors both sides. Magazine release buttons are already on both sides of the receiver in the same spot. Unlike a standard AR-type rifle, the bolt handle is mounted on the side of the receiver. By default, you’ll find it on the left side. Again, there is no right or left-hand bias with the bolt system. If you retract the bolt about half way, you can pull the handle straight out. This places the bolt in the maintenance position. Now, you can rotate the bolt handle right through the receiver and out the other side. Voila! Now you have a rifle with a bolt charging handle on the right side. Again, the two configurations are absolutely identical. Bottom line? If you’re a lefty, you’ll think this rifle was made specifically for left-handed shooters. If you’re right-handed, you’ll think it was made just for you. Cleaning! Getting the gunk and funk out of the barrel and extension is ever so easy when you don’t have to navigate around other parts to get there. Same caliber barrel swaps. Want to mount a short barrel instead of the standard? No problem. Caliber conversions. Calibers that have compatible bolt sizes can be converted with just a barrel swap. Converting a 5.56mm ARX100 to a 300 AAC Blackout version comes to mind. Overseas, this feature has already been used to create ARX variants in 6.8 SPC and 7.62x39. The process is easy, and again, requires no tools. Place the bolt in the maintenance position. Pull down on the two sliding tabs in front of the magazine well, and the barrel pops out. That’s it. While we’re talking about the barrel assembly, you’ll note that the ARX100 is a piston operated rifle. When you remove the barrel, the gas tube and piston comes with it. It’s captive to the barrel, so parts don’t fall on the floor when you remove the barrel for cleaning. Just in front of the stock, you’ll find a gas setting valve with two positions: “S” standard and “N” non-standard, or adverse operation. The “N” setting allows more gas into the system to force the rifle to operate in extreme conditions or when exceptionally dirty. And there you have it - a quick tour of the Beretta ARX100. Next time we’ll take a closer look at how it operates and shoots.